Because so many people want to know how to stay open in love when they don’t feel very loving in the moment, we wanted to give you some tips and ideas on opening your heart in difficult circumstances.Here’s an example of what we mean…Every once in awhile, John gets really angry– so angry that Marsha thinks he’s out of control, she does not feel either respected or loved, and doesn’t want to be around him. She doesn’t know where all of this anger comes from, what she’s done to deserve it and why it’s directed at her. Pretty common circumstance, right? Many people, including us, can identify with this situation to a certain extent, at one time or another in their relationships. In every relationship, there’s what we call a “relationship dance” that take place. A “relationship dance” is an on-going, repeating pattern of behavior that both people play out in the relationship. Sometimes a relationship dance can be beautiful, loving and wonderful and other times, it can be painful, exhausting and difficult to deal with—even though there might be great love between the two people. Well, here’s our take on John’s and Marsha’s relationship dance–why it’s causing challenges in their relationship and how they can open their hearts to one another again… Very often, upsets, anger, judgment, lashing out, or making each other wrong is sometimes nothing more than a mask for the pain that’s underneath what someone is feeling. What seems to be John’s unreasonable anger can be his way of “puffing” himself up because he’s feeling vulnerable and afraid–fearful that if he doesn’t react in this way, he won’t be heard, honored or get his needs met. Please understand that we are not condoning or validating anyone’s out-of-control rage or anger toward another–nor what happens as a result of this rage or anger, especially if physical violence is the result. What we are suggesting is that in most cases, people who are expressing anger are not the strong, powerful people they are pretending to be in the moment. This may come as a shock to some of you to know that when most people act in this way, their actions and reactions are coming from their pain and their inability to know how to deal with their pain. Marsha, on the other hand, feels blind sided by John’s anger. She reacts from old patterns, either freezing and withdrawing from him or lashing out at him with her own anger. Because John’s anger may be so unreasonable and blown out of proportion, it may look like he’s the only one who has contributed to their upset but that’s usually not the case. Marsha’s probably been doing her own things to contribute to the situation. Under the guise of helping John to become a better person, she might be pushing him in ways that he doesn’t want to be pushed. Whatever way their “relationship dance” goes, both people close their hearts to each other, shutting down any love or connection that they once felt for one another. 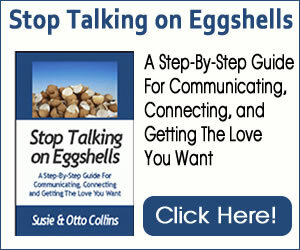 For many couples, the situation becomes too much of a “hot potato” and is never talked about again and therefore, never resolved. Even if the two people do talk about the issue, there’s often a standoff, with both people holding on to being right. So what can John and Marsha, as well as millions of other couples, do to resolve their situation and create a closer and more connected relationship? 1, If the person is full of rage and you fear for your safety, temporarily leave the situation. If alcohol or drugs are involved, make sure that before you try any of our suggestions, the other person is sober and/or drug-free. You may want to get the help from a professional drug/alcohol counselor or groups if you are with a person who is a chronic abuser or if you are one yourself. 2. Know that underneath most displays of anger is a feeling that there is a need that’s not being met or a want that’s being stifled. Very often when there’s a trigger that sets off the anger or upset, we bypass what’s truly at the heart of the situation and go to the reaction that’s familiar, instead of the fear or the cause. Whether you are the “angry” partner or not, be open to searching underneath your behavior for any fears or unmet needs and wants. What is the need or want and what do you need to do to move toward having it without using anger as a crutch? It might be that you need to be more honest more of the time. It might mean that you not run away when things get tough. It might be that you need to take more responsibility in your life. Make an agreement to listen to one another, speak from your hearts, and open to understanding each other, even though you may not agree. 3. We all create stories in our minds about what certain things mean that very often have nothing to do with the reality of the situation. It’s the stories we make up that usually drive our behavior so finding out the facts of the situation is really important. Examine the stories that you are creating in your mind that triggers any behavior that sooner or later you regret doing. Know that you can change the stories that you tell yourself about every situation and begin taking steps to change them by looking at the facts. 4. Commit to not holding grudges from the past. If you need to do some forgiveness work around some issues, do it. If you need to make amends for something you did in the past, do it. Clear up anything hanging over from the past so that you can start together with a clean slate. Anger is an emotion and emotions are our friends. Our emotions tell us what we need to take a look at next in our lives if we are open to doing the work. Let the message of anger be “I need help” and then take the responsibility for looking at the issues underneath that you really need to address. Caught your link on Facebook and it intrigued me so decided to read your article. For 27 yrs of my former marriage I thought I had to do a dance to stop the anger that came my way in waves – called the circle of abuse. After being divorced and a couple of years and going through couseling, I came to realize that you can love someone, care about someone, but when you are on the receiving in, the abuse is the abuse. There is no reason on this earth, as far as I am concerned, to have an understanding attitude and take into account the reason behind the explosions or anger or blame. The results are the same. You are being abused. Period. And when you make excuses for the other person all you do is cancel out yourself. Madeline: Thanks for your post. YES we agree with you that stopping abuse is absolutely important. We congratulate you for taking that step to get out of an abusive relationship and to make your healing a priority. In this article, we focus on the kind of anger that is not abusive, but that does occur. Your partner might have a bad day or be stressed out or experience something frustrating and upsetting and get angry. This happens for every single human being at one point or another. The important thing in a case like this is to not make the situation worse by jumping to a conclusion, being critical or meeting the anger with your own anger. In a healthy relationship, there is an understanding that anger will happen from time to time and that’s natural and normal. Agreements can be made for how the couple can stay connected even when anger comes up for one or both people. This might mean giving the angry person space, asking if he or she needs support or being a presence of calm, love and understanding for what the other person is experiencing. ANGER IS A WEAPON. IT IS A MASK FOR DEEP-SEATED UNRESOLVED PAIN. IN MY OPINION THIS ALL BEGINS IN INFANT AND PHALIC CHILDHOOD. THIS IS WHERE PAIN HAS TURNED INTO ANGER. SOMETIMES THE ABUSE FROM PAIN WILL CREATE AN EXPLOSIVE ANGER. THESE PEOPLE SHOOT WITH THEIR ANGER INSTEAD OF GUNS. IT REALLY SAD BECAUSE ON THE THE SURFACE, MOST OF THESE PEOPLE ARE GOOD PEOPLE WITH UNRESOVED PROBLEMS CONVERTED TO ANGER. IT TAKES TIME TO UNPEEL THE LAYERS. MOST PEOPLE, ESPECIALLY MEN DO NOT WANT TO EXPOSE THEIR WEAKNESS. RENEE CRENSHAW: Anger is a powerful and intense emotion. It does often stem from early experiences and unresolved fear and pain (fear is actually at the root of anger for many people). And, you are right, anger is sometimes directed at others in a way that is destructive and abusive. Another person’s anger can feel like a weapon. Additionally, anger is just an emotion and it will rise and then fall away if we can stop fueling it. When we remember to breathe and pause and learn from what it is telling us, we can more quickly and easily (and peacefully) resolve conflicts and situations. Please do get to a safe space if another person’s anger is abusive or violent towards you and please do get help if your own anger is causing others harm. And please do consider the lessons that anger is in your life to teach you. 10 Easy Ways to Turn Up the Heat on Valentine’s Day That Most Guys Miss! Overwhelm Ahead– How Will Your Marriage Be Affected?